With the hype and overwhelming admiration for the recent Netflix supernatural television mini-series; Stranger Things, you knew that sooner than later, life would somehow find it’s way to imitating art, and we think we’ve found a contender who has nailed that old adage to a T.
Olivia a 9 year old girl who lives in Los Angeles and is at an age where she is being very clear about who she is and how she wants to look. So when she decided to shave her head before going back to school, her parents were more than supportive of their daughters choice. With this bold move came the explanation and justification that the length of your hair doesn’t change who you are, that no matter it’s size, you can still be confident, powerful and treat people with kindness. Some of these traits were evident in the character of ‘Eleven’, the mysterious shaved-head girl with the tel-kinetic powers who stole the show in Stranger Things. 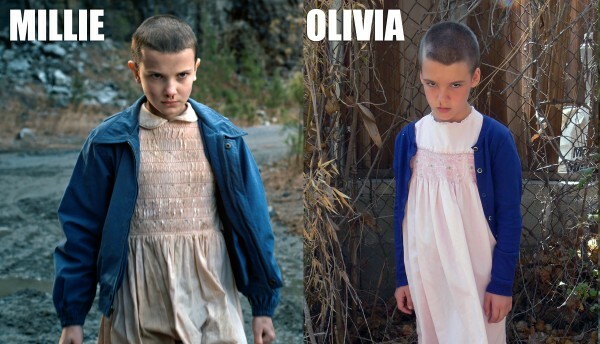 Though her family wouldn’t let her actually watch the hit Netflix series (other than a short clip on YouTube), Olivia and her mom Ozma had some fun recreating the look of ‘Eleven’, from the character’s costume to some fun poses that look like they came right off the set of the show itself. 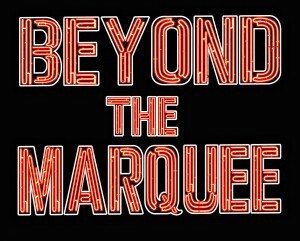 Click ahead for some more fun recreated photos and more about the story of Olivia and her quest for her self-identity. 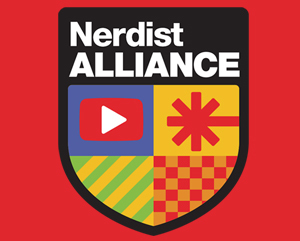 We caught up with Olivia’s mom Ozma and she told us the amazing story of Olivia’s choice to shave her head and the connection to Stranger Things. So at first I explained that I fully supported her wanting to do that and we talked about people who are women who have their hair that way. I showed her before/after photos of Charlize Theron when she was in Mad Max and some of women I know who have short/shaved hair of different ethnicities. Then I showed her pictures of Eleven from Stranger Things. She asked me about it more and I explained the character as someone with incredible powers who has been treated bad and believes she is a monster, but uses her powers to save a friend who is in trouble- and Olivia really liked that. 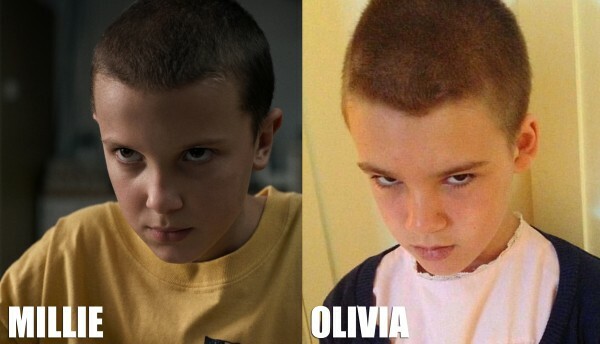 Kudos to Olivia, she totally nailed Eleven’s intense look. We went onto YouTube and I showed her the video Millie Bobbie Brown (the character of Eleven) posted of her hair getting shaved and Olivia got all excited and said, “Mom I want my hair like that.” She didn’t want me to take her to get it done, she wanted me to do it, so I did and even though I was worried because it’s a bit choppy she LOVED it. I also mentioned being concerned about her (biological) dad’s response and she was like, “It doesn’t matter. It’s my hair.” It was a super, super proud mom moment for me. She is very much about being true to herself and I am extremely proud of that. 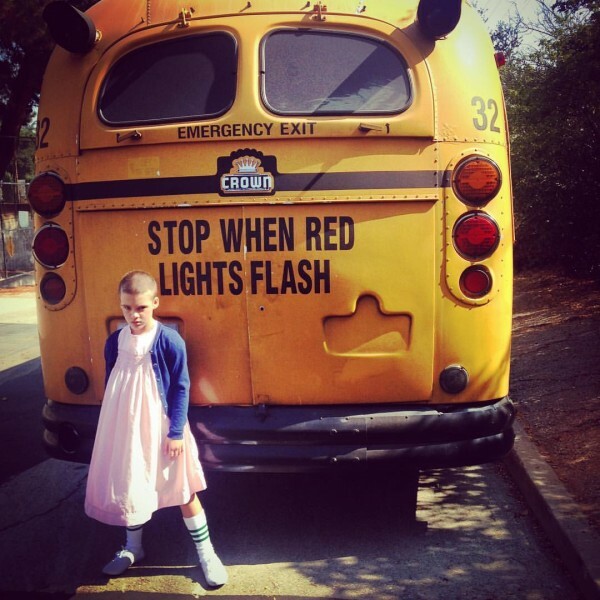 Of course we were curious about the fun photo-shoot of Olivia recreating some iconic looking scenes from the show dressed as ‘Eleven’. We wondered where they sourced the costumes and did anyone comment about her incredible similarity to the Netflix show’s character while in public? Here’s what Ozma had to say. Thanks to Ozma and Olivia for letting us share this story and some of these fun pictures with our viewers. 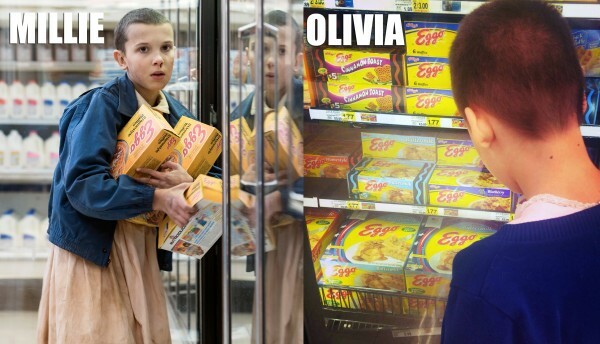 It’s pretty uncanny, she’s certainly nailed the look and what an incredible coincidence that Eleven and Olivia sound alike…ok, we may be stretching the similarities a tad too far. Maybe not. Remember, Halloween is coming and if your daughter wants to shave her head, you have a perfect opportunity to have fun with her by letting her be ‘Eleven’ this year, just head to your nearest Goodwill to assemble the outfit and local grocery-store for those Eggos!